A very early and rare, probably Southern German, Bohemian chandelier around 1730. Small traces of a silvering can be found on the structure. These structures with arms in the form of a spider are often described as Italian but regarding the used cut glass pendants I am quite sure that the structure was made in southern Germany, perhaps Austria and furnished with cut glass pendants produced in Bohemia. The forms of several glass pendants descend from the early Italian rock crystal pendants and here imitated in glass. The forged iron stem in the centre across all the cut glass stem elements and receiver plates with their arms are shoved. For the upper two receiver plates was no screw thread necessary but a simple but ingenious thickening on the iron stem was sufficient. The lower two main receiver plates contain the six light arms and the 'reflector' arms. 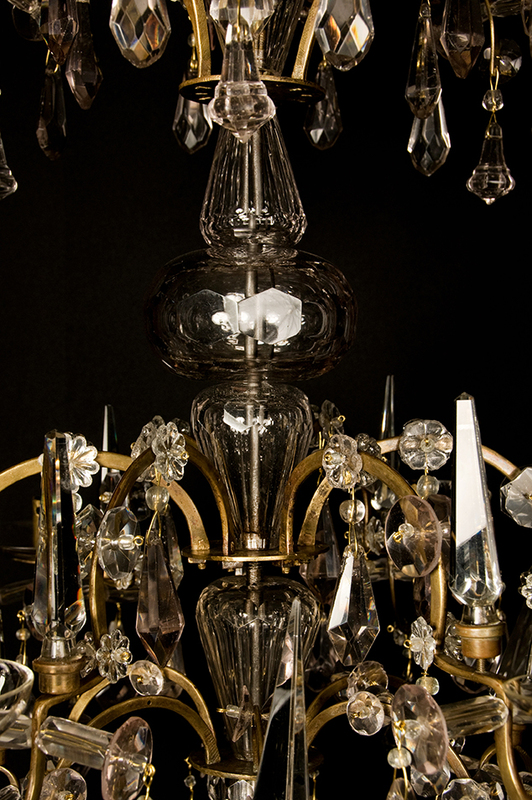 In between these four receiver plates are placed ten sphere and baluster shaped cut and faceted glass stem elements. On the scrolled arms of the first tier are placed 6 ornaments 'obelisks' as reflectors and also mounted in the middle of the light arms from the second tier. 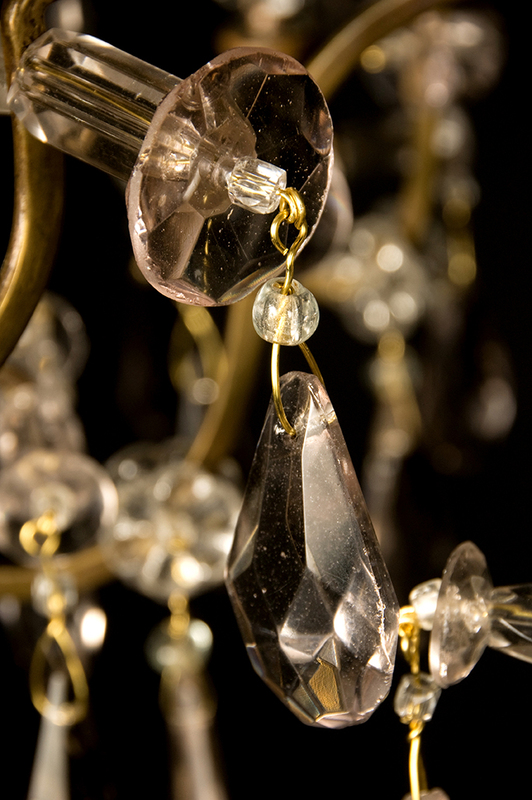 A simular model of the shape of the used candleholders on this chandelier can be found on an important chandelier in the Paul Getty Museum in Los Angeles. Other features that this chandeliers descending from southern Germany / Austria are the broad flat form of the metal plates used for all the arms and the way the pendants are mounted on, precursor of the later Austrian Marie-Therese chandeliers.